Chrysler PT Cruiser Review: If you like the way the PT Cruiser looks, you'd better move fast, as it probably won't be around much longer. This iconic Chrysler, one of the brand's most popular cars when it was introduced 10 years ago, was scheduled for a timely death in 2009. The New Chrysler Corporation decided to bring it back for one more year as a 2010 model, this time dubbed the PT Cruiser Classic. That "Classic" badge is actually a nice way of saying this is a car that hasn't been updated in a long, long time. Yes, there have been a few facelifts along the way, but the 2010 PT Cruiser has essentially the same bones as the original version, that debuted a decade ago. It's really an old car with new shiny paint. Still, if you like the way the PT Cruiser looks, and a lot of people do, this is probably your last chance to go out and buy a brand new one. The PT Cruiser was a revolutionary car when it was introduced. It had head-turning style with the look of a classic American hot rod, along with a very practical, family friendly cabin. It brought retro styling to the masses with its affordable price and useful four-door layout and one-piece trunk lid. Today's PT Cruiser doesn't snap necks like it used to, mainly because it's been such an overwhelming success. Since it was introduced Chrysler has sold more than 1.3 million of these cars in 60 countries around the world, which took its unusual looks right into the mainstream. It's no longer weird to see one. Unfortunately, Chrysler never nurtured the PT with the updates and redesigns it deserved. The changes through the years have been relatively minor, with the exception of the turbocharged and convertible variants that were added. Drive a PT Cruiser today and you'll see why the term "Classic" isn't such a good thing. It's not as supple and refined as the small crossover vehicles that have become popular recently, feeling more choppy, noisy and rough than the competition. And it�s not a fast car, especially now that the turbo model has been eliminated. The only engine is a 2.4-liter four-cylinder that makes 150 horsepower. It's an engine that Chrysler describes as "time-tested," and that's the truth. That's the exact same amount of power it produced when the PT Cruiser was introduced in March of 2000. So, after all this, why would you think about buying one? Simple. It's a bargain. 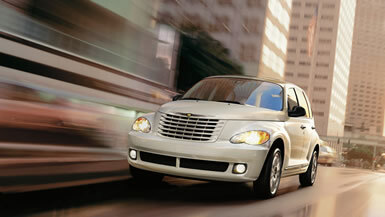 The PT Cruiser Classic is only available in one trim level, starting at $18,995. It's a handsome car with lots of chrome jewelry and body-color bumpers, which make it look timeless. And it's nice enough on the inside with the special-color trim that make it look like a custom hot rod. You'll also get reassurance from the recent J.D. Power and Associates Initial Quality Survey. The PT Cruiser was rated tied for first place in model year 2009. So with well over a million plus copies sold the PT Cruiser Classic has plenty of reasons to brag before it retires. What was tested? The 2010 Chrysler PT Cruiser Classic with a base price of $18,995. Options on the test car: None. Total MSRP price as tested: $18,995. Why avoid it? It hasn't had a thorough update since it was introduced a decade ago, and you can no longer get the turbocharged model, so acceleration is moderate. Why buy it? It has the classic look of a PT Cruiser, which is not only unique, but also surprisingly useful and practical. The Bottom Line: Chrysler's 2010 PT Cruiser Classic looks essentially the same as it did 10 years ago. This timeless design is unmistakably retro, and it made an impression on more recent automotive history by inspiring several copycats. In some ways it's a forerunner to the crossover vehicles that are becoming more popular today. It's still a practical car, with good dimensions, for squeezing the most usable volume out of a compact shape.